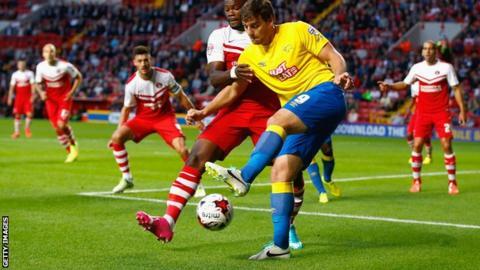 Charlton remain unbeaten in the Championship after condemning Derby to their first defeat of the season. George Tucudean scored his first goal for the Addicks to give them an early lead but Jamie Ward levelled with a strike from the edge of the box. Charlton restored their lead when Yoni Buyens scored from the penalty spot after Richard Keogh fouled Tucudean. Igor Vetokele headed in a third in the 77th minute before Ward pulled a goal back with five minutes to go. Derby have only won once on their last six visits to the Valley. That victory, which came last season, was their only win there this century. Charlton were ahead in the 11th minute when Tucudean latched onto Jordan Cousins' cross to smash the ball past Derby keeper Lee Grant. Ward hit a powerful equaliser into the top corner in the 31st minute and Derby went close to taking the lead but Craig Bryson and Jeff Hendrick shot tamely at Charlton's debutant keeper Nick Pope. The home side regained the lead just before half-time with Belgian midfielder Buyens' cool penalty after Keogh pulled down Tucudean. The Romanian striker was replaced at half-time but Charlton continued to pile on the pressure. His replacement Franck Moussa fired wide from close range before Vetokele headed in Laurie Wilson's cross. A weak effort from Ward squeezed through Pope's legs to give Derby hope of snatching a draw but Charlton held on for the three points. "This is the best I've seen us play and Derby didn't have an answer. "With seven points out of nine, we must be happy. "At 3-1 you want to sit back, have a cigar and enjoy the game. We couldn't do that but we did enough." "It's disappointing to lose and the goals came at bad times for us. "The second goal, right on half-time, gave them a massive lift. "We were a bit deflated but I expected us to go on and get an equaliser. It wasn't to be and the third was a killer for us really." Match ends, Charlton Athletic 3, Derby County 2. Second Half ends, Charlton Athletic 3, Derby County 2. Foul by Franck Moussa (Charlton Athletic). Attempt missed. Craig Bryson (Derby County) right footed shot from the right side of the box is close, but misses to the left. Assisted by Chris Martin. Substitution, Charlton Athletic. Morgan Fox replaces Johann Berg Gudmundsson. Attempt saved. Franck Moussa (Charlton Athletic) right footed shot from outside the box is saved in the centre of the goal. Assisted by Igor Vetokele. Goal! Charlton Athletic 3, Derby County 2. Jamie Ward (Derby County) right footed shot from the centre of the box to the centre of the goal. Attempt blocked. Johnny Russell (Derby County) left footed shot from the centre of the box is blocked. Attempt blocked. Jamie Ward (Derby County) right footed shot from outside the box is blocked. Assisted by Craig Forsyth. Joseph Gomez (Charlton Athletic) is shown the yellow card. Attempt saved. Igor Vetokele (Charlton Athletic) right footed shot from the centre of the box is saved in the top centre of the goal. Assisted by Lawrie Wilson. Offside, Derby County. Johnny Russell tries a through ball, but Leon Best is caught offside. Goal! Charlton Athletic 3, Derby County 1. Igor Vetokele (Charlton Athletic) header from very close range to the high centre of the goal. Assisted by Lawrie Wilson with a headed pass. Substitution, Derby County. Leon Best replaces Jeff Hendrick. Offside, Derby County. Jake Buxton tries a through ball, but Jeff Hendrick is caught offside. Attempt blocked. Jeff Hendrick (Derby County) right footed shot from the right side of the box is blocked. Assisted by Craig Bryson. Franck Moussa (Charlton Athletic) wins a free kick in the attacking half. Attempt missed. Johann Berg Gudmundsson (Charlton Athletic) right footed shot from outside the box is too high. Assisted by Joseph Gomez. Attempt missed. Richard Keogh (Derby County) right footed shot from outside the box is just a bit too high. Corner, Derby County. Conceded by André Bikey. Substitution, Charlton Athletic. Lawrie Wilson replaces Jordan Cousins. Corner, Derby County. Conceded by Tal Ben Haim. Attempt missed. Craig Bryson (Derby County) right footed shot from outside the box is close, but misses to the right. Assisted by Chris Martin. Jake Buxton (Derby County) wins a free kick in the attacking half.